Cholic Acid ELISA Kit | Cell Biolabs, Inc.
Cholic acid is a primary bile acid that is synthesized from excess cholesterol by the liver. Bile acid synthesis is critical for cholesterol removal from the body and uptake of dietary lipids, fat soluble vitamins, and other nutrients from the small intestine. Determining circulatory levels of bile acids can be used to identify certain liver diseases. Our Cholic Acid ELISA Kit is designed for detection and quantitation of cholic acid in plasma, serum, urine, feces, or lysates. 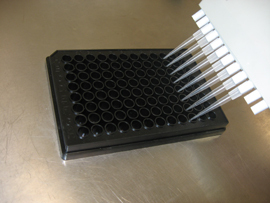 This assay is a competitive ELISA where unknown samples are added to a plate pre-adsorbed with a cholic acid conjugate. An anti-cholic acid antibody is added, which is then detected by an HRP conjugated secondary antibody. Cholic acid levels in unknown samples are calculated based on a cholic acid standard curve.